Diary of a Miner: Island hopping without getting my feet wet! I hadn't brought my diamond pickaxe with me this time, so there was not much I could do. I really wanted to destroy it, so I improvised, rather efficiently I might add, with a large rock! 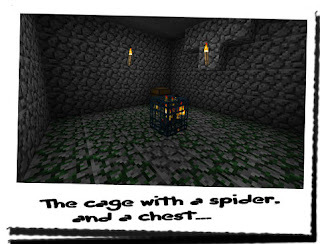 I knew what had happened to the last cage when I had destroyed it; the small skeleton had crumbled and the cage had stood destroyed, apparently harmless. Hoping the same would happen, I brought the rock crashing down onto the top of the cage, leaving a sizable dent in it. I repeated it a few times until the metal of the cage began to buckle and the strips of it began to snap. After a few minutes of continuous battering, the entire cage was flattened; the small spider trapped inside had long since disappeared, and it had done so with an elongated hiss! Initially I thought more spiders had come from nowhere, but after a moment I realised the source. Throwing the rock to one side, I then turned my attention to the chest; this small chamber with mossy cobblestone walls... I had found something very similar before... I had been cautious last time, but I had only found a few items of worth, and a book... "Codex Solis"... Book of the Sun... 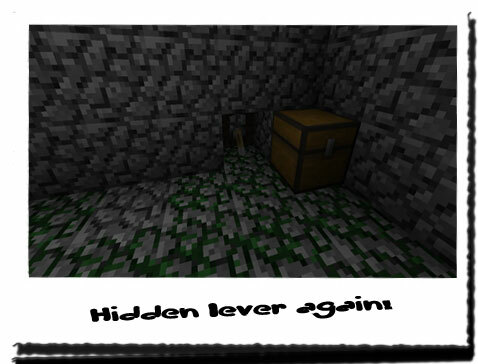 The experimental information to help allow Creepers to walk around during the day, fully exposed to sunlight! I had also battled zombies and spiders; zombies, I knew, crumbled to dust when exposed, but I had never seen a spider in direct contact with sun light... Shaking it from my mind, I took the cautious approach, and retrieved the small dagger from my bag. I lifted the lid of the chest slightly with the blade, expecting another spider to lay hidden within, but nothing... Once again I had been overly cautious! But as they say "Better to be safe than sorry!"... Opening the chest fully, I lifted the lid up 90 degrees and let it rest against the wall. Inside were some items of apparent randomness; a saddle, some very mouldy bread, a few iron ingots and a bucket! There was no book or sulphur this time, which made my heart sink a little; I was in desperate need of sulphur to make more TNT! I went to close the lid, and then felt a cold draft sweep over my hand as I reached for it... Setting the lid down into place, I peered at the top and realised that a small hole existed behind the lid of the chest! Dropping the bag, I dragged it off to the right a bit, to reveal a small hole with another lever concealed inside! What was it with these people and hidden things! 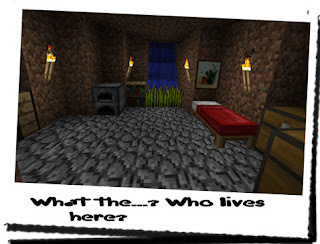 Once again, I was weary of what it might do; was it connected to a trap door, would it release lava into the room, or maybe flood it with water, or giant spiders... Or Creepers! The intrigued side got the better of me, and I pulled it! Once again, I flinched as I heard a click and a long scraping noise behind me! Turning around, I saw that where there had been a wall was now a hole! Not just a hole, but a very long tunnel! So long, I couldn't see the end! Where did this go? Who used this? Why was this here? Hundreds of other questions sprang to mind instantly, but the one that put me into action was "I wonder what's down there?"! Picking up the bag, I set off down the long corridor... I looked back, half expecting the wall to slide shut, but it remained open... 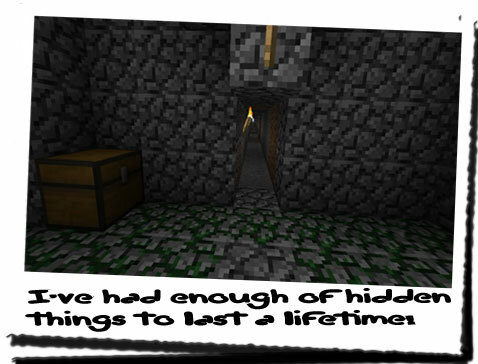 Continuing down the corridor, hundreds of questions swam around my head as I made my way down the smooth stone walls! It seemed the entire length of the corridor was lit with torches at regular intervals, and a large amount of light was visible at the far end, but I couldn't make out what it was! As I walked, I couldn't see any variation in the height or width of the corridor, nor did I see any separate passageways that led off in a different direction. After a few moments of working it out, I pinned my direction as heading more or less due West; I had entered through the hole where the portal had been, facing South, found a stairway facing East and then continued West from a corridor leading to the chamber! I took the map from my bag and studied it; from the exact location of the portal I had marked on the map, I could work out where the corridor might lead, but I couldn't base distance because of the lack of landmarks. Chances are, THEROS didn't even know about this bit! Unless... Unless this was the "unfinished business..." he had mentioned...? I tried to gauge the distance by saying that every centimetre was 100 metres. That meant that this tunnel was many centimetres long!... On the map anyway! I continued going for hours, not stopping in case the lights went out, or a Creeper decided to pop out of a wall! I spent the better part of four hours walking continuously down a straight corridor towards a very bright light in the distance, which got brighter and brighter the closer I got! They say that you should enjoy the journey as much as the destination you are travelling to. Well, the destination was much more interesting than the journey; hours of staring at blank stone walls with slight variations of dirt and sandstone every few hundred metres! In the end, I had started humming to myself! It kept my spirits up, and it kept my mind active! Just as I was really getting into the whole humming, the strange light object came into focus, in the distance... It was lava! The corridor ended in lava! A few metres more, and I stood before what turned out to be an actual lavafall... A waterfall, but with lava! It pooled into a small recess in the floor, and climbed a series of steps going up... Was this it? Four plus hours of walking to find some lava...? I was about to turn back and give up, when I noticed another light source up above; it was faint, but from it I could see it was actually a hole with a small amount of green visible... Was this more mossy cobblestone...? Or something on the surface? There was a way up there, and it involved the lava... I couldn't work out how to get up, and nor could I tie the lava into the equation either, however, as I thought about how to get up, I had turned to the right... Just to the right hand side was a small amount of cobblestone embedded into the wall again! Knowing exactly how this worked, I started to dig at the cobble with my bare hands until I found the hollow spot, and dragged the rest out with the leverage I gained! There, just behind the cobblestone, as with the other lever, was a lever sitting against the stone! Pulling it, I stood in awe as I watched a staircase slide into place which ran the entire height of the corridor, up to the light source at the top... Waiting a few moments to see if the stairway was on a timer or something else sinister happened, I began to ascend the stairs... The whole way was lit with torches, as with the corridor, and right at the end was a hole... As I emerged, I noticed that it had begun to rain, and it was getting dark. Not knowing where I was, I took the map back out and looked at it... Knowing the distance I had walked, I was guessing I wasn't on the same island anymore! And as I had traveled due West the entire time, the only place I could be was... On the small island at the far North West corner of the map! I had gone island hopping without even going near water! 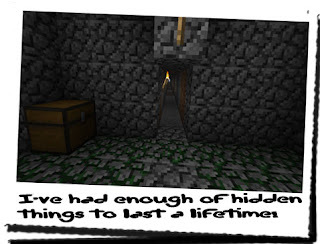 Putting the map away, I edged around a small pool of water, only to find large amounts of cobblestone... I knew cobblestone meant the presence of something sinister, so I took the small dagger from my bag and continued around the pool. As I did, I looked up, noticing two trees growing from a huge cube of dirt that seemed to have been deposited in the middle of a large hole! As I got around to the Southern side, I turned around and saw a door! Not like a door which I had encountered recently with complex mechanisms and hidden levers, but a standard wooden door! 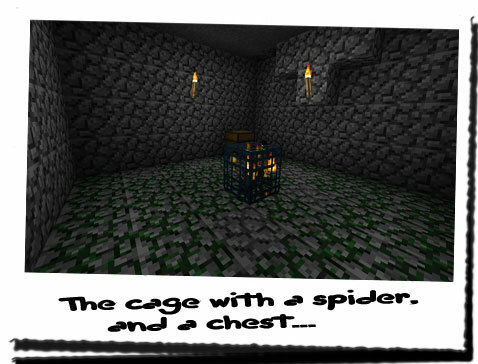 It was set into the cube of dirt... Edging forwards, I peered through the small holes in the door to find a modest hovel of a home, complete with running indoor water, indoor farm, bedroom, kitchen and storage in a single room!